Our vision at The Law Office of John Vernon Moore, P.A. is defined and guided by satisfaction, exceeding client expectations consistently. The Law Office of John Vernon Moore, P.A. specializes in personal injury claims, family law, and criminal defense. We also represent clients with homeowners association matters and other related real estate legal issues. To discuss your current legal situation, call The Law Offices of John Vernon Moore, P.A. at (321) 426-0209 for a free 30 minute consultation. THE LAW OFFICE OF John Vernon Moore, P.A. We make it our mission to commit effort, time and resources into all clients who we represent, inclusive of family/divorce/child support cases, criminal law situations, or personal injury claims for Brevard County, Florida residents who are in need of quality legal support. No two cases are ever exactly alike. Accordingly, every client we work with is provided with a unique legal strategy suited for their specific situation to guarantee a high degree of positive outcome. The Law Office of John Vernon Moore, P.A. is fully licensed to operate and service clients in different personal injury, family law, and criminal law cases in Brevard County, Florida, and offers calculated and aggressive representation. To book a convenient appointment time with the best legal representation and defense in Brevard County, Florida, please click the Book Now button. 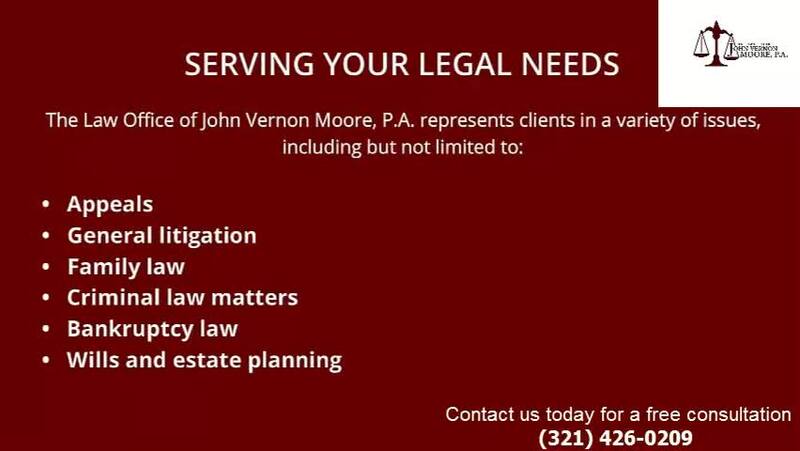 For immediate assistance to discuss your current situation call The Law Office of John Vernon Moore, P.A. for a free 30-minute consultation. Don't lose another day due to the negligence of others. If you have been a victim of Personal Injury learn more on how we can help.